Ryan Hurley loves to solve problems. That’s how the son of Hurley’s founder, Bob, and creative director of a California-based brand under the Nike umbrella starts his design process. The Art of Surfing: Can board design really affect performance, scoring? technology—cabling to keep the movable fabric locked to the waist. “For the surf world, this is definitely something new,” Ryan says. But obsessing about boardshort technology isn’t new to Hurley—the man or the brand—and the concept of tech innovation really reaches into the sport’s history, Ryan says. Tech as we know it has not long been a part of surf performance, but trace the sport’s roots to custom surf board shapers—Bob, who worked at Billabong before starting Hurley in 1999, learned the art in the 1970s—and Ryan says surf athletes have long had a relationship with fine-tuning equipment for performance. Hurley was the first to introduce ultra-lightweight four-way stretch on boardshorts during a time, Ryan says, when the industry placed a focus on bulk and unnecessary embellishments. The new Hyperweave has gone even lighter, reducing weight in the waist and elsewhere to create efficient stretch and durability. Part of this focus on technology comes as Ryan’s personal drive. And part comes from Hurley’s relationship with Nike, which has been a wholly-owned subsidiary of the giant company since 2002. As Hurley and Nike work to blend the tech-minded focus of the Oregon-based brand with the surf culture found at Hurley, something Ryan says “can always continue to get better,” he says the passion for solving problems runs through both teams. And having the ability to leverage solutions from other sports and then apply them to water-based design solutions gives Ryan’s team an edge—and a distinction—in the surf industry. Within a surf culture not necessarily always known for high performance, Ryan says that means Hurley needs to focus on translating performance to products in order to create distinction. In a world where the generic design of each sport loses some of its edge as the sports world starts to amalgamate, that doesn’t mean there isn’t a place for elite-level athletes to start to shine, such as surfers now competing on a legitimate world tour. So with the Phantom Hyperweave Ryan’s representation of that goal of performance-driven design, he knows that in today’s quick-moving culture of design Hurley can’t stop with just a boardshort if Ryan wants to extend the brand’s ethos beyond one product. That’s why Hurley also launched a line of in-water compression gear—a style of performance gear growing in popularity—and hasn’t stopped. 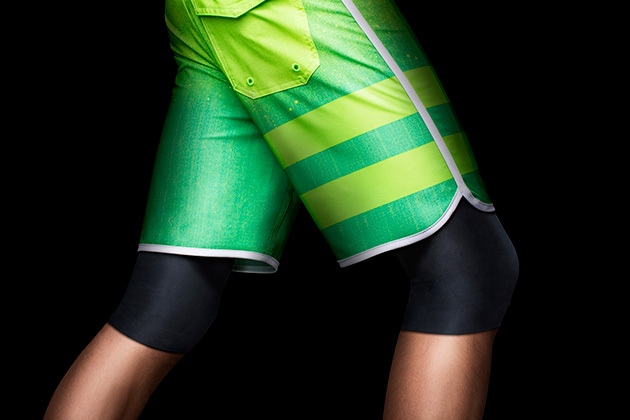 “That’s what I’m working on,” he says when asked about taking performance design beyond the boardshort. Ryan says he wants to create real performance benefits across the line, whether a cap or a shirt. “That stuff doesn’t have to have performance innovation, but we are thinking a lot deeper about those types of things and thinking about those uses and water-based solutions so you have real innovation you can sink your teeth into,” Ryan says. “We want real products with real solutions, more than just boardshorts going forward." That’s the problem Ryan Hurley wants to solve next. And that challenge will lead the way Hurley—the man and the brand—designs. Tim Newcomb covers stadiums, sneakers and design for Sports Illustrated. Follow him on Twitter at @tdnewcomb.